People sometimes ask whether it's possible to make a rotating kite. In fact, there are several types commercially available as well as others that appear at festivals from time to time. For some of these, rotation is an essential part of its means of achieving lift, but for others, it's more incidental. those, like the rotating box, which rotate about a roughly horizontal axis in line with the wind. In the first two types, rotation provides or contributes (if only a little) to the lift, but in the last, it's simply for artistic effect. Although most aircraft have fixed wings, rotary aircraft are an important group. These include helicopters, and their now obsolete predecessor the autogyro (more correctly called the gyroplane). The gyrokite is basically a gyroplane, that is, a helicopter with an unpowered rotor. Some confusion exists as to how the gyroplane works, and indeed, how a helicopter can glide to a very safe and controlled landing after an engine failure. This becomes clear if you think of each rotor blade as a wing of a glider, which just happens to be going round in circles instead of in a straight line. Just like a glider, a rotor blade of a gyroplane generates lift as it slowly descends, and tends to accelerate if it's angled so as to descend faster. 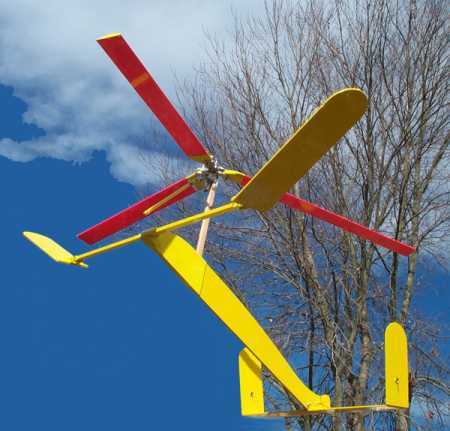 The gyrokite flies with its rotor tipped slightly away from the wind, so that the wind passes up through its plane, causing it to rotate and generate lift. There is a fairly heavily marketed plastic gyrokite available. Those who've tried it generally seem to be of the opinion that although it makes a fascinating toy, it needs very smooth winds to fly successfully. Only buy one if you can afford the loss if it crashes and breaks! The main thing seems to be to make sure the rotor is spinning fast enough before releasing it. Here are some useful flight notes which were posted to rec.kites. Many experiments with gyroplanes were performed, mainly by the Spaniard Juan de la Cierva (1895-1936), before rotary flight was conquered. In particular, it was found necessary to allow the blades to move up and down slightly as they rotate in order to allow for "dissymmetry of lift", or the fact that each blade flies alternately with a head wind and a tail wind as it rotates. It was also found necessary to allow each blade to swing slightly ahead of or behind its natural position. The lack of refinement of such details may account for the limited success of modern simple plastic gyrokites. In the 30's, Captive Flight Devices of Pennsylvania marketed a gyrokite with a 36" rotor mounted on a machined shaft and a ball race. It also had wings and a tail, and flapping rotor blades. Needless to say, its weight meant that it needed a strong wind to fly, but it was reputedly very stable, as one might expect: the gyroscopic effect of the rotor should help to stabilise it, and its momentum should provide lift during lulls in the wind. Hart gives a photo of a similar device in the Smithsonian, invented by Charles Chubb (or Chupp? ), but no details are given in the text. The Chupp Roto-Flyer, thought to date from the 40's, has been studied by Gene Rock, who has put together detailed plans, and built a reproduction model, pictured here. In addition, Daniel Bertolino has built several successful gyrokites. 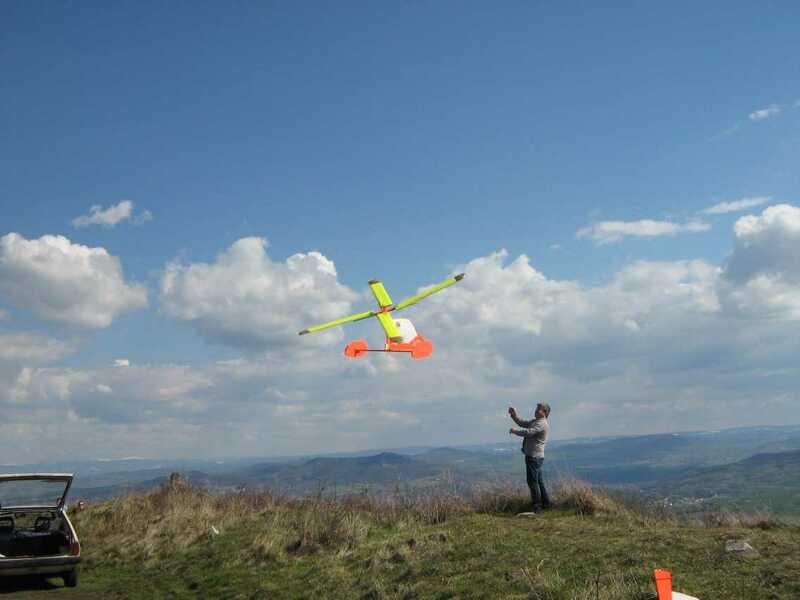 Here he is, flying one against a beautiful background in the French Auvergne, and here's a video clip of Daniel launching and flying it. In 1943, the Germans deployed the Focke-Achgelis F.A.330 unpowered gyroplane for reconnaissance from submarines. It was towed by the submarine and lifted an observer to a height of several hundred feet. The rotor blades could be jettisoned "in an emergency", allowing the observer to descend by parachute. What sort of emergency was envisaged by the designers might not be immediately apparent, until you realise that the gyroplane would have been a give-away to the enemy if spotted - the strategy must have been "spot your target, then get down FAST!" The windmill kite by Australian Don Matthews is, as far as I know, the only one of its kind. It follows the same principles but uses four rotors made out of fabric, which consequently have a much lower aspect ratio and so are less efficient. Here is a picture of it. Don tells me that the rotors are about 1m in diameter and rotate at around 50 rpm (at a guess), blending the colours nicely and making an impressive sight. It flies well in a moderate wind, rising to a line angle of about 40 degrees in ideal conditions. Whereas the gyrokite cannot fly without the rotor spinning quite fast because it uses the rotation to greatly increase the effective wind speed, rotation in windmill kites is more incidental. It adds greatly to the visual impact and may still contribute to the lift, though less so than in the gyrokite. Here, for example, is Sonja's Odysee, consisting of several counter-rotating wheels. Her Metamorphose uses four wind turbines to turn two rollers, driving a band of coloured film to produce continuously changing coloured patterns. A truly remarkable creation. The UFO and rotor kites are quite different and are to the gyrokite as a paddle steamer is to a ship driven by a water screw. Nevertheless, they are generally more successful. A horizontal spindle has two or more roughly semicircular paddles attached to it, as well as one or more circular or oval pieces mounted perpendicular to the spindle, for stability. Several different configurations along these lines are possible. The original UFO kite was invented and patented by Ken Sams who often flew it in London at the Round Pond or from Westminster Bridge. He died in 2003 aged 80. Two paddles are formed from a single oval with the spindle running through its major axis. It has another oval of the same shape and size perpendicular to the spindle and at its centre. The paddles are often made of silvered mylar sheet decorated with holographic patterns, causing it to catch the sun and glint as it rotates. To onlookers who are unfamiliar with it, it can be hard to make out what it is, and hence its name! The rotor kite is a little different. It has two disks perpendicular to the spindle near to its ends, and two or more paddles. The paddles are curved, causing it to rotate. Both the UFO and the rotor kite work by the Magnus effect, which is the force that results from the interaction of an air stream and a rotating body. The curved flight of a spinning ball is due to the same effect. The direction of rotation of the kite is such that air passing over the top is flowing in the same direction as the paddles and so moves faster than the air passing beneath, flowing against them. Whenever the speed of an airflow increases, there is always a resultant drop in pressure, just as in the case of air flowing over an aeroplane wing, and this is what generates the lift. 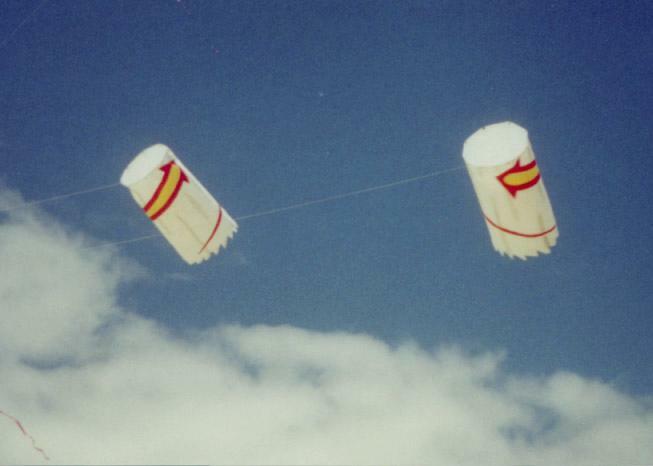 In the case of the UFO kite, the paddles are flat so there is no obvious reason why it should spin. In fact, it tends to need a little help to get it started, but then continues to spin by a mechanism that is not altogether clear. The explanation would seem to be that air passing underneath moves between the paddles, helping them to rotate, whereas air passing over the top against their motion largely avoids them. Here is a picture of a UFO made out of ripstop nylon and fibreglass rod by Anthony Thyssen, who has a discussion of rotor kites online which is well worth reading. He also has plans for a rotor kite - raw materials cost: virtually nil. 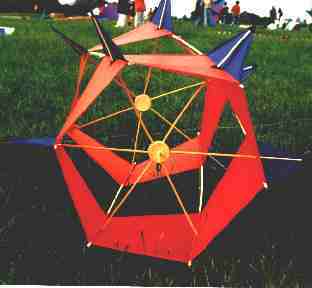 Another rotating kite uses the same principle as the UFO, but uses two rotating elements mounted at a dihedral on either side of a fuselage. It looks like a model glider except that the wings spin on spindles running their lengths. It's made in plastic and hums as it flies. The skybow is a case of taking a principle to the extreme. It consists of nothing more than a length of ribbon up to 1000ft long, tethered to the ground at each end. Swivels at each end, and at points along its length, allow it to rotate (faster in the middle) and so generate lift by the Magnus effect, causing it to arch into the sky. As it spins, it makes a weird whining sound. The inventors, Jim Mallos and Tony Frame put together a fascinating web page, which includes a recording of its sound. If you were to take a traditional box kite and twist it, then suspend it in the wind by a point along its axis, it would spin. Or, slightly more scientifically, make your box kite using parallelograms instead of rectangles for sides of the box sections. Rotation is purely for visual effect and doesn't provide lift or stability. A number of variations have been tried, such as twisted winged box, and using a hexagonal or circular cross section instead of square, as in the "Revolver", shown here All have a tendency to drift to one side on account of the rotation, so it's usually best to fly them in counter-rotating pairs, as in this picture of two cylindrical ones by Anthony Thyssen. Sonja Graichen of Germany solved the problem by mounting two counter-rotating sets of twisted vanes (like the wings of a winged box, without the box) on a single spindle. A third fixed set of vanes at the front provides a convenient towing point. Bol and basket kites are often made so as to rotate, but this is purely for visual appeal. Depending on your definition of a kite, they may not be real kites at all, since they don't really fly but just bounce around on the ground in a "boingy boingy" sort of way. If they do generate lift, it's simply because the highest part is normally in faster moving air than the lowest. The name "bol" comes from the French word for those large wide-brimmed breakfast coffee cups used in France. Essentially a bol or basket consists of a parachute with an extra large vent, which may amount to as much as 90% of the diameter. It's made to rotate by secondary vents between the segments, arranged to direct air in a clockwise (or anticlockwise) direction. There do not appear to be hard and fast rules as to when a kite is a bol and when it's a basket, but those with a large main vent amounting to most of the diameter are generally regarded as bols, and the more parachute-like ones as baskets. Distinctions have also been drawn as to whether the secondary vents are adjacent to the leading (bridled) edge, or the trailing edge (the main vent). Bols are sometimes confused with the circoflex, but this is in fact quite different. In particular, bols are typically made to rotate (though they needn't be), and they don't generate net lift. All the legs of the bridle are of equal length, and they meet at a point on the axis of the kite. There are pictures of various bols and baskets on the Wind Climbers home page, which also contains plans for a 4ft basket, and a picture of Ed Hummel's 35ft diameter bol.